There’s typically a line-up out the door on weekends, so we decided to pop in bright and early at 10AM. 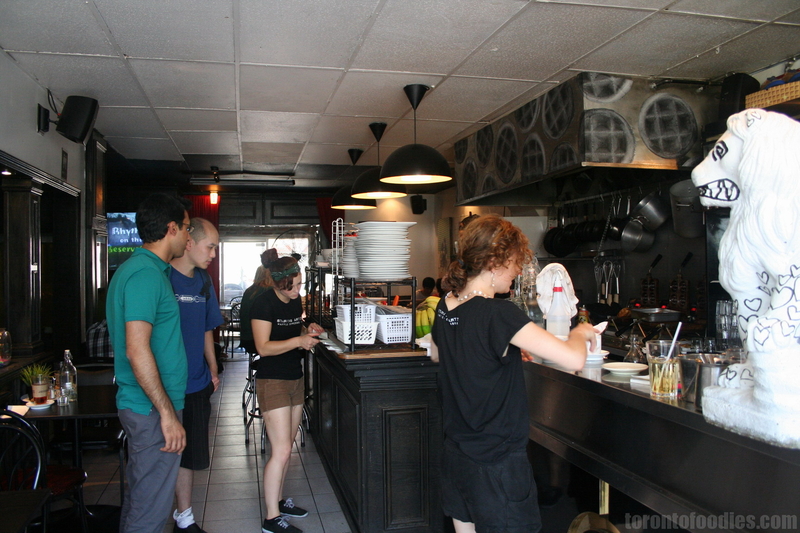 The restaurant seating area has a great view of the open kitchen with its four waffle irons, while old shows/movies are shown on a projector. The seating in here can get a bit warm though. 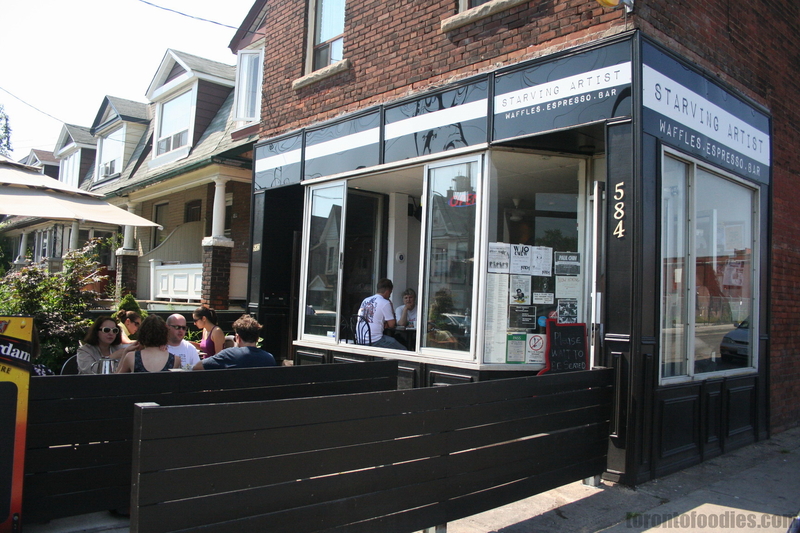 In addition, there’s a front patio and back patio, but beware the wasps in the summer. Having a large group, we were seated in the back patio, and had a bit of a wasp problem during our meal (despite a pair of hanging wasp-traps). I opted for the Breakfast Benny ($11.60) – poached eggs and bacon on mashed potato waffles, with sides of salad and potato salad. The potato waffles really jumped off the menu — and yes, they’re mashed potatoes pressed in a waffle iron. While the edges were awesomely crispy, the bulk of it were sad and soft under the eggs, but very savoury and flavourful. The bacon was weak and chewy. The eggs were decently poached (albeit using an egg-poaching tray), with the yolk on the firmer side (but still runny). 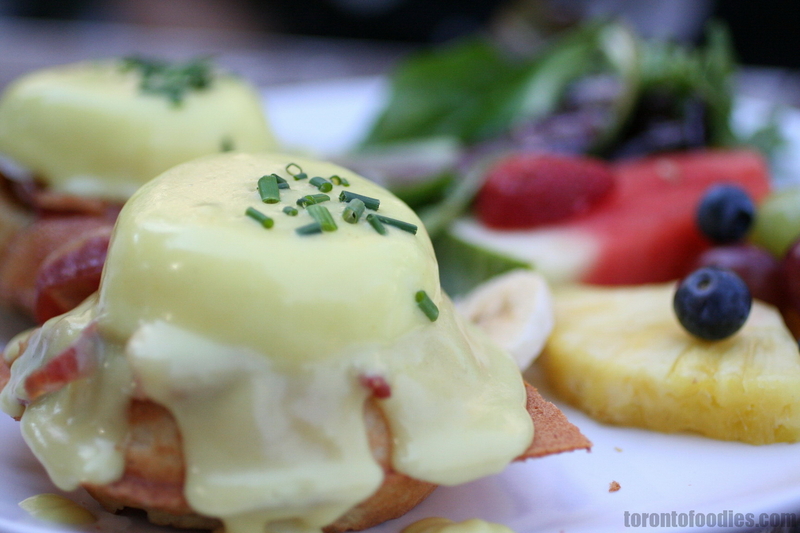 Hollandaise wasn’t standout. The salad was a mild olive oil vinaigrette, and potato salad was sadly store-bought. One of the gents ordered the Waffle Benny ($11.00), so I engineered a half-half swap. The regular waffle suffers from the same softness issues under the eggs. I was hoping for more sweetness in the batter, but the waffle was pretty indistinct in flavour. Certainly softer than the potato waffles, but a lot less flavourful. The edges, again, were crispy and light, but the draw of waffles should be the high surface area resulting in extra crunchiness. 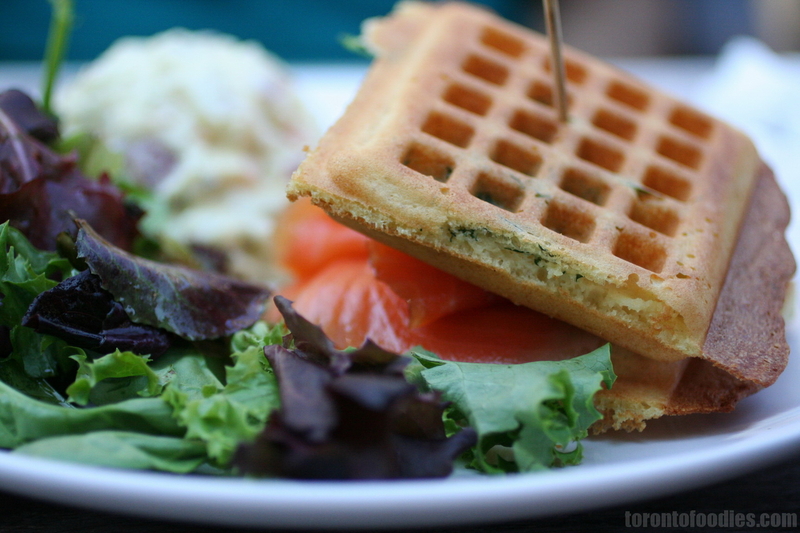 The Smoked Salmon Waffle (~$11), with capers, cream cheese on a dill waffle, earned a lot of praise around the table. 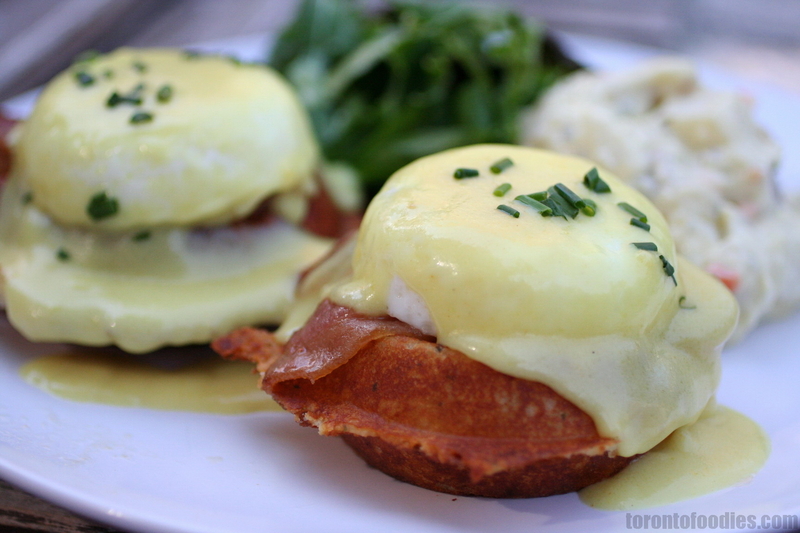 I think I shall try this next time, especially since it doesn’t seem to get as soggy as the eggs benny options.